Boston Cosulting Group's new analysis points out: digital industrial technologies assisted manufacturing (referred as Industry 4.0) creates a lot of challanges and opportunities for economic developers. 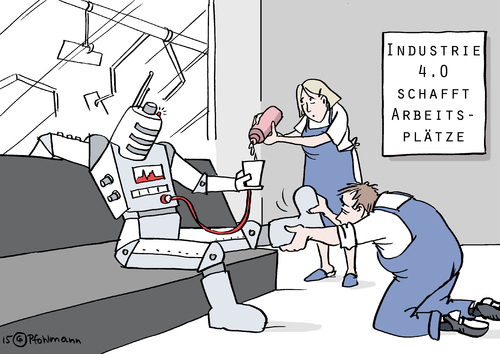 How will industrial jobs evolve? "The increased use of assistance systems means that the qualitative changes brought about by Industry 4.0 will likely be positive for the workforce. The number of physically demanding or routine jobs will decrease, while the number of jobs requiring flexible responses, problem solving, and customization will increase. To perform effectively with Industry 4.0, workers will need to apply a variety of “hard” skills. They will have to combine know-how related to a specific job or process, such as techniques for working with robots or changing tools on machines, with IT competencies that range from basic (using spreadsheets and accessing interfaces) to advanced (applying advanced programming and analytics skills). The need for multiple hard skills and the unprecedented scope of changes on the shop floor mean that “soft” skills will become more important than ever. Employees will have to be even more open to change, possess greater flexibility to adapt to new roles and work environments, and get accustomed to continual interdisciplinary learning." What should education systems do? "Education systems should seek to provide broader skill sets and job-specific capabilities, close the IT skills gap, and offer new formats for continuing education." How can governments support job creation? "To maximize the number of jobs created by Industry 4.0 and help companies retain as many employees as possible, governments must help improve coordination among stakeholders in business and academia. In many cases, these efforts will need to focus on promoting the successful implementation of Industry 4.0, which is a prerequisite to generating manufacturing growth and creating new employment opportunities." We can agree: the 21st century manufacturing requires never-seen flexibility and complexity from employees. And specialized infrastructure and suppliers from business environment. I'm affraid: a simple "coordination" among business and academia won't be enough. I recommend a cluster-based economic development, upgrading your local education, infrastructure and institutions to a specific industrial direction. Finally, here is a short video about the industry 4.0 practice and vision of Germany's manufacturing giant, BOSCH Inc.